The Philadelphia Eagles are a professional National Football League (NFL) team based in Philadelphia, Pennsylvania. They’re part of the league’s National Football Conference (NFC) East division, and their home stadium is the NovaCare Complex in their home city. Furthermore, the current coach of is Doug Pederson. They are a respected team in the football industry with a long history in the sport and a dedicated fan base. Read on for more on the Eagles’ history and performance in the NFL. Founded in 1933, the Philadelphia Eagles replaced the bankrupt Frankford Yellow Jackets. The Eagles franchise rights were given to Bert Bell and Lud Wray after the NFL allowed an expansion. They experienced season losses in their first decade after being established. Their uniform colours are midnight green, silver, black, and white. Their mascot is Swoop, an American bald eagle wearing the midnight green jersey. Dallas Cowboys: this became more prominent in the 1960s. Washington Redskins: this is also a historic rivalry. Pittsburgh Steelers: another bitter rivalry that dates back to 1933. It emerged because they are teams from the opposite sides of the same state. The Philadelphia Eagles also have their own fight song. They play it during home games before kickoff and after touchdowns. The Philadelphia Eagles have had successful runs in the NFL over the years. They won the National Football League Championships in 1948, 1949 and 1960 before the league adopted its current form. More recently, they won the 2018 Super Bowl LII where they beat the New England Patriots. Their victory must have taken the football league by surprise as they had failed to make it past the Wild Card playoffs in 2010-11 and 2013-14. 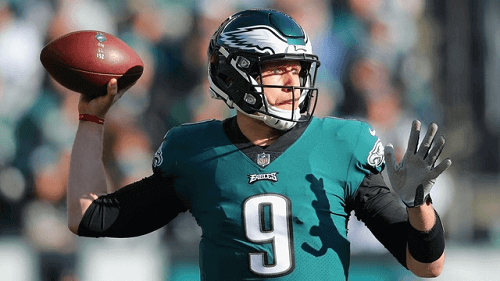 After such a long dry spell, the Philadelphia Eagles have shown American football bettors that going for the season favourite doesn’t always guarantee a victory. It’s best to pay attention to the team’s form. Hopefully, next year, they’ll keep up their winning streak and claim another victory.